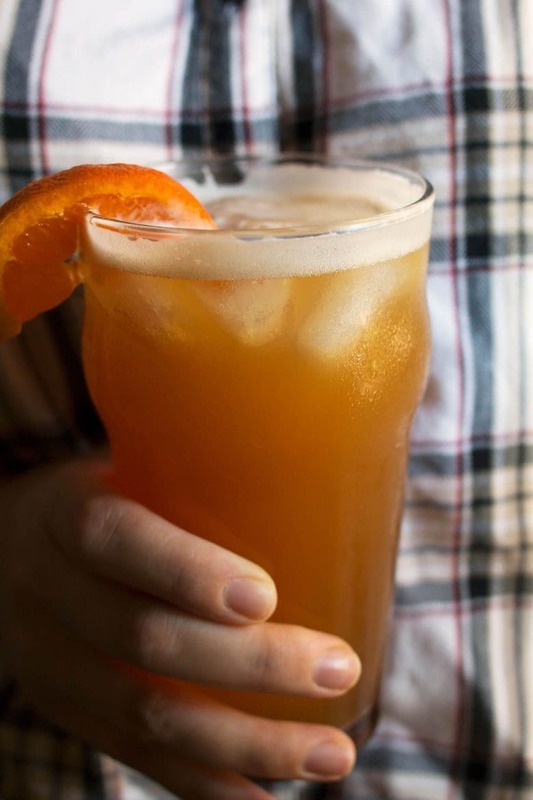 This orange bourbon beer cocktail is your new favorite summer drink. Pair it with a burger or some Italian sausage for a great summer BBQ. I am always planning summer BBQs or backyard parties. I just love having people over, especially if we can all hang out in my yard. For me it’s more than just hanging out though; I love coming up with party menus. There are so many options for food and I think most people concentrate on that aspect when planning. But what about the drinks? Don’t leave out the drinks! Signature drinks are one of the coolest things you can add to a BBQ. You don’t have to get all fancy – I sure don’t. No need for handwritten signs or fancy straws. Just ask your guests if they want to try your new “drink concoction”. Trust me, there is a mixologist in all of us and that other side needs to come out when you’re entertaining. 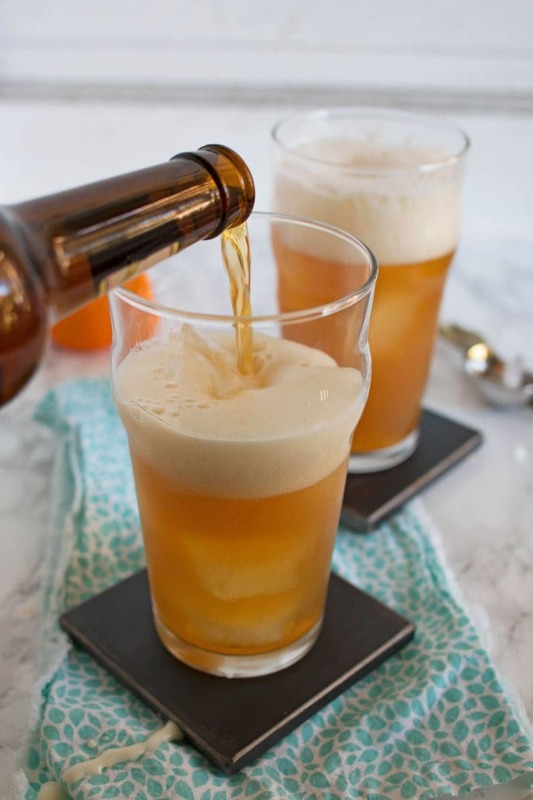 Beer cocktails are a great way to dab your toe in the mixology pond without having to break into a sweat. 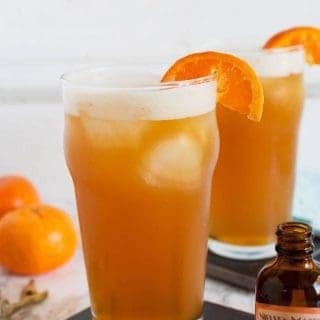 This orange bourbon beer cocktail is delicious. It’s a super easy way to add a fun cocktail to your party menu without having to spend a lot of time bartending. Plus, it has a secret ingredient that is delicious. 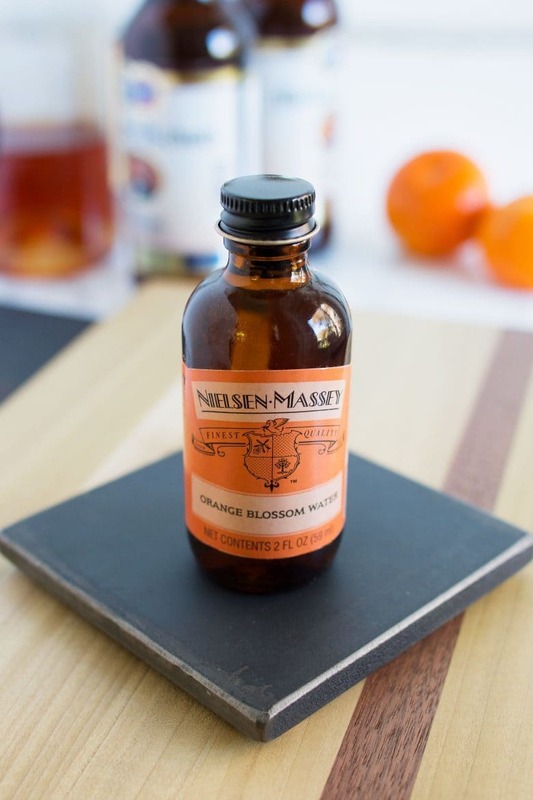 Nielsen-Massey makes this Orange Blossom Water that is amazing. It’s produced by water distillation of the blossoms of the bitter orange tree. It even has a romantic other name – the “Essential Oil of Neroli.” How’s that for a party topic? All Nielsen-Massey products are all-natural, certified gluten-free, certified Kosher, allergen-free and GMO-Free – perfect for any guest you may invite over. Orange is the first flavor I think of when experimenting with bourbon cocktails. Also, when I think of summer and beer, I want to smell all of the aromas of citrus. 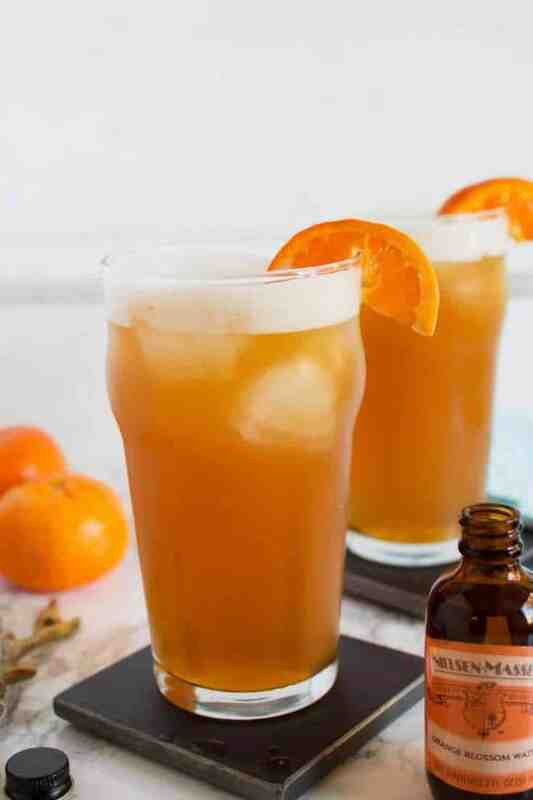 It just seemed natural to combine these ingredients together for this orange bourbon and beer cocktail. To get started you need a pint glass and some ice. Fill up your glass and pour a shot of your favorite bourbon on top. Then it’s time to add your Orange Blossom Water. Top that with a wheat beer – any brand is fine – and a orange slice for garnish. This drink is not for the weak at heart but bourbon and beer fans are going to fall in love with it. Pair it with a juicy burger and you have yourself the perfect party duo. Summer is about to get really fun! Fill a pint glass with ice. Pour the bourbon and Orange Blossom Water over the ice. Add the beer until the glass is full. This sounds refreshing and delicious! Perfect summer evening drink! I’m not normally a fan of beer, but I’m pretty sure I can get behind one that’s mixed with bourbon and orange! Delightful! Ok seriously this sounds amazing and I think need to try it tonight! Thanks for sharing! Oh, Jenny. This cocktail combines some of my favorite things, and it’s SO PERFECT for the summertime! This is a must make in my book!